The last FileMaker Pro upgrade appeared about a year and a half ago. Version 12 introduced a broader set of changes then than these made available earlier this month in FileMaker Pro 13. But the 50 or so features which 13 does introduce are impressive, welcome, and very well-implemented. 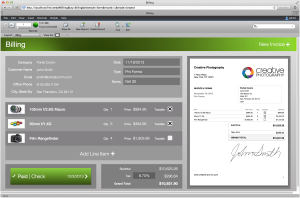 Most significantly, FileMaker Pro 13 further advances your ability seamlessly to present data in full desktop-style data directly on the web. In sophisticated fashion, users can now fully interact with databases in their browsers (forms, effects and gestures etc on mobile devices), make and see updates in real time, manage content and perform automation. Where sharing and publishing data was once limited in scope and ease of use and/or where many FileMaker operations were once limited to the desktop, everything is now also instantly and transparently available on mobile platforms as well as other desktops. 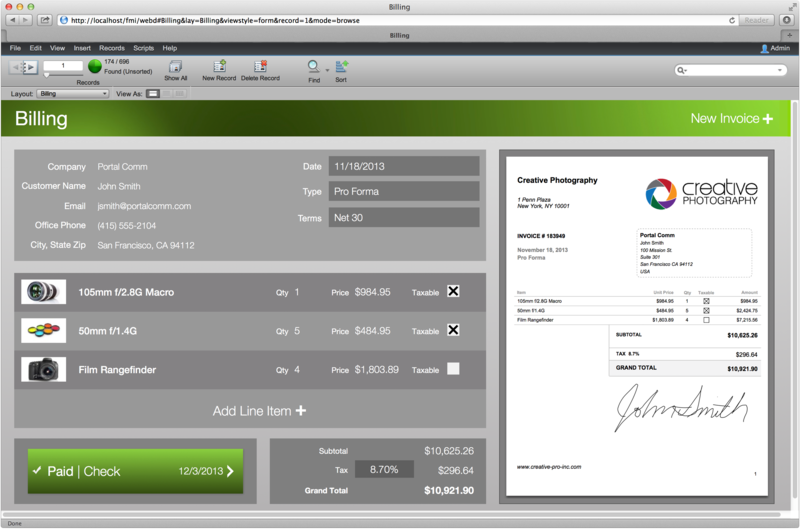 FileMaker can now live in your browser too. 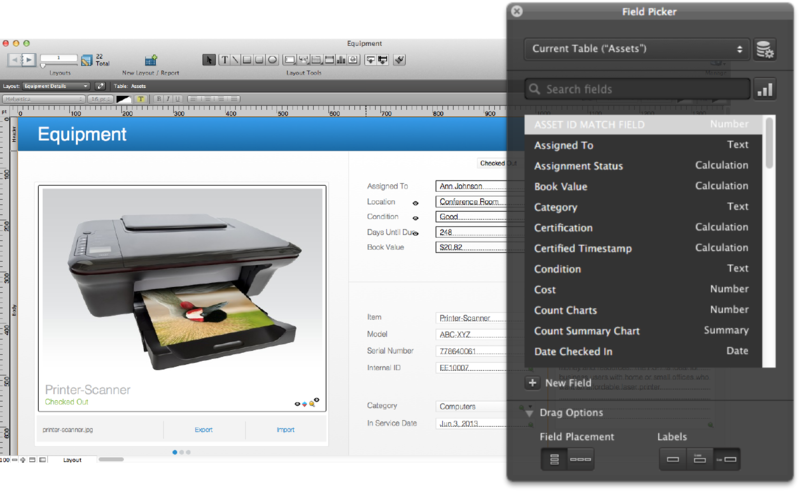 There were previously two models for publishing data from FileMaker Pro on the web. 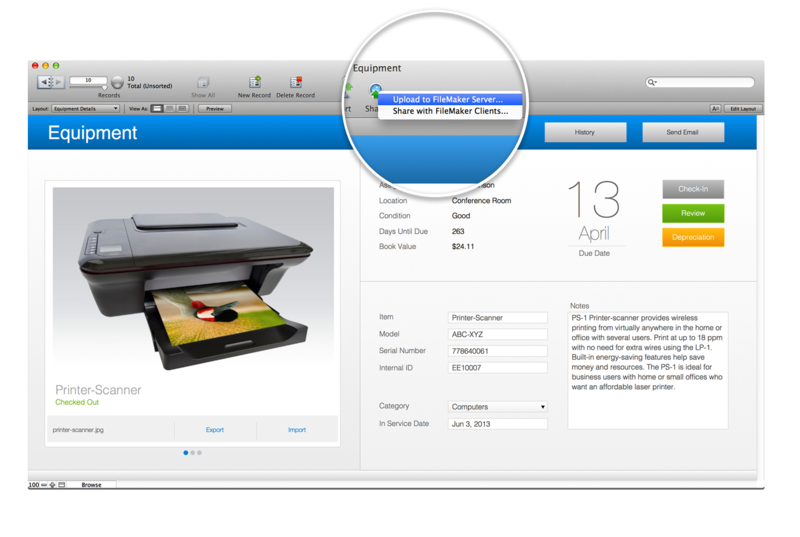 Version 13 introduces FileMaker WebDirect. This is a completely new browser-based technology using HTML 5. Data from a database built in (or seamlessly converted to) FileMaker Pro 13 can now be displayed in browsers. So far, Safari and Chrome are certified by FileMaker; but not FireFox. This doesn’t mean that the latter won’t work – just that not every last aspect of functionality is guaranteed; although the use of 100% HTML 5 and CSS technology means this is not a major drawback. In Filemaker Pro 13 users create a solution intended for the web in the usual way but with browser optimization at the forefront of their minds – probably using this help document until they become more familiar with the process. They may well also use one or more of the customized starter solutions that come with the product. Once the file is hosted on FileMaker Server 13, it really is as simple as accessing everything that you can work on in the FileMaker client in a browser. As you perform standard operations in FileMaker Pro 13 – from simply adding and editing database fields, through all the usual scripting, to dragging-and-dropping files into container fields (over 40 attributes for which data type can now be returned in the appropriate function), every change is reflected immediately via Server in browser(s) which access it. FileMaker gives clear and useful guidance on the number of concurrent users this infrastructure supports. Although it’s in the hundreds rather than thousands, that’s in accord with the FileMaker user-base and intended market. 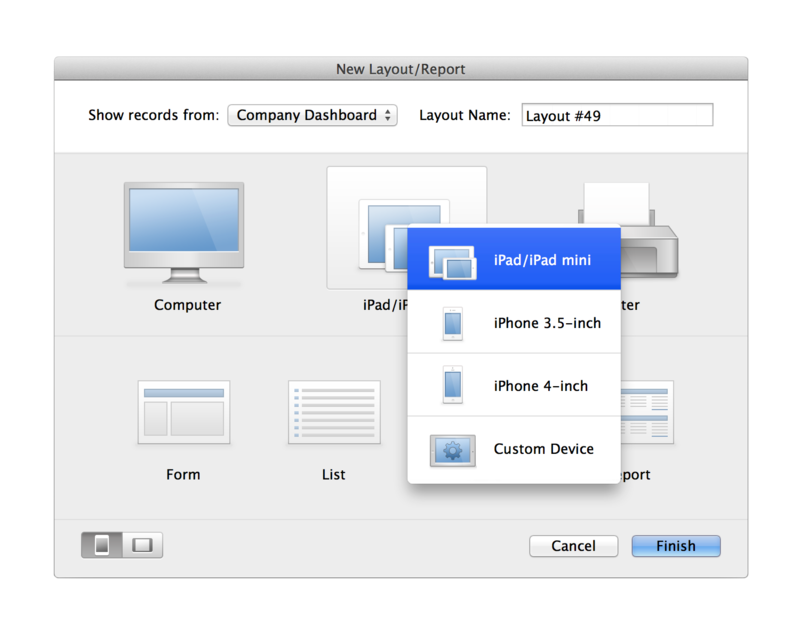 The development, editing and control of layouts – the basis of FileMaker Pro interactivity – have been streamlined; they were found nicely improved during the current evaluation. A “field picker”, for instance, uses the HUD model instead of a conventional popup Inspector. Saved changes can now be undone; this assists in reducing the number of backup/milestone versions of files under development. Custom themes and styles can now be shared too; more types of data can be dragged and dropped onto design layouts with FileMaker Pro 13, which ships with 11 new such themes. These are like “skins”; they allow developers without design expertise to create aesthetically pleasing layouts very easily. What’s more, buttons, fields – almost any object, in fact – can all have their own styles. Although based on Cascading StyleSheets (CSS), WebDirect does not expose raw CSS to users: the emphasis is on transparent ease of use. FileMaker has obviously thought long and hard about exactly how to embrace as much of the expansion from conventional client-server models to a device-independent platform as possible. Although a great deal of technological sophistication lies behind the paradigm in FileMaker Pro 13, it really has been implemented in such a way that database designers, developers and specialists even can still focus on the data and not that technology. Expectations of a visually-appealing experience on iOS are well met in this version, then. FileMaker Pro 13 supports more behaviors of iOS than ever before: slide controls, popovers and record scanning with gestures as well as single-click bar code capture and new/more design attributes in the Inspector (inner/outer shadows, padding, text baselines, layout backgrounds) dramatically speed up your work. In fact, much attention has been paid to optimizing the software’s look and feel in iOS… seven new context-sensitive iOS keyboards have been added; and a number of new – and very visually appealing – Starter Solutions added and/or redesigned. Although this release concentrates on WebDirect, FileMaker has introduced several significant new Script steps relevant to its integration with HTML and multiple devices. One of the most welcome allows objects to display conditionally based on logic, not workarounds. Server administration has been simplified: it too has a new HTML 5-based admin console; this was not tested during this evaluation, but (others’) opinion is positive. Along with this penetration outside even the traditional client-server environment comes the need for increased security: FileMaker Pro 13 Advanced supports AES 256-bit encryption for data, making transmission between server as safe as industry standards require. 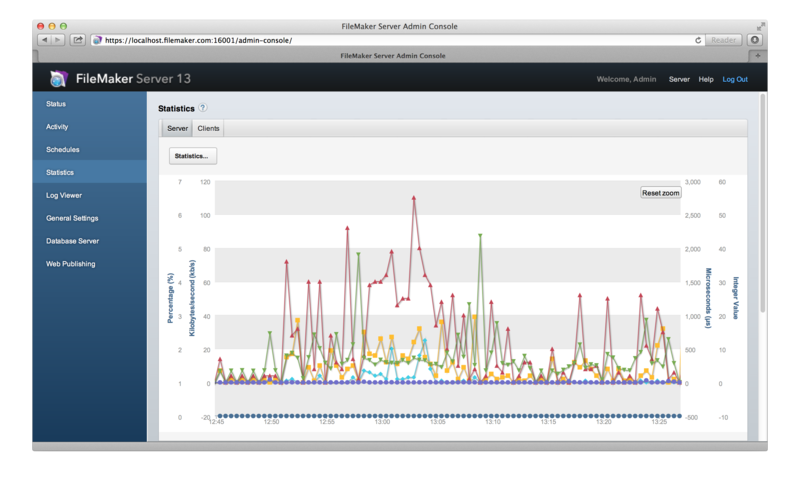 Lastly, FileMaker Pro Server has been rebuilt with 64-bit architecture, making for faster WAN and web performance. 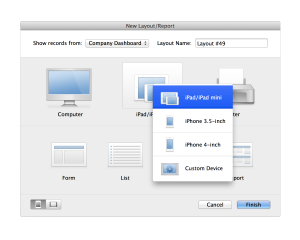 During a testing period of over two weeks, FileMaker Pro 13 performed as one would expect – impeccably. Of all the functionality explored, nothing significant seemed missing, out of place, hard to understand or use. 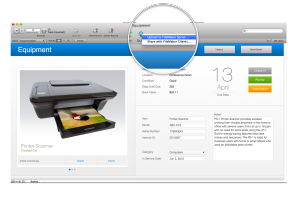 Everything has been implemented to the high standards which we’ve come to expect of FileMaker. Options to activate all the new functionality mentioned here give the user still greater control. The intelligent menu hierarchy that has always supported FileMaker Pro use is retained and makes sure that the most needed items are the most accessible but that the others are rarely obscured. All in all, this version (13) represents a significant step forward in several ways: enhancing the way data is presented and making the process of doing so easier and more flexible than ever before. Greater efficiency and sophistication with Container fields in the web context. And tighter, more fluid, integration with iOS and mobile usage. 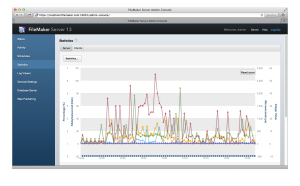 If you’re a FileMaker Pro user, you’ll want to upgrade with hardly a second thought. The product is expensive. But the breadth of its functionality, its robustness as a product (one must now – happily – say, as a platform) are well established. If you’re looking for a state of the art product that will perform 99% of regular data-intensive tasks, this updated and improved version (13) is the reference product of its kind. 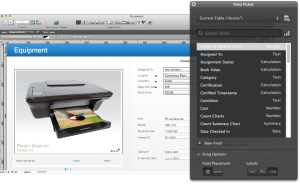 Pros: Filemaker Pro 13 continues a stable and feature-rich tradition. Given the need to make more and more forms of more and more data instantly available via the web, this is the right move at the right time. It works. And works well. Site Licenses and further pricing details here. Version options here. During my time of developing databases since version 2.x (this is going back some years now), I have found FileMaker Pro to be an excellent application primarily for the ease in which databases can be created and the flexibility and useful features it provided. However, since FileMaker Pro 10, I have noticed certain unwelcomed changes. For a start, there are instability issues. We have lost Instant Web Publishing (IWP) in FileMaker Pro 13. And the security of data in fields of any table is now compromised due to a security hole placed into the Data Viewer feature since version 10. 1. FileMaker Support pages show a question from a developer titled “FileMaker Go – Calculations involving GetNthRecord fail after 29 records” and a response suggesting FileMaker Inc is aware of the issue since 10 April 2013. Whether the issue has been fixed in FileMaker Go 12, I observe in FileMaker Pro 13 Advanced that the issue remains and actually fails to show the calculation result from the 79th record onwards. This is a major problem for my clients in terms of financial information they need to work with in the databases. So, on checking this with FileMaker Pro 12 Advanced I see the issue does not exist. It is only FileMaker Pro 13 that has introduced the bug since the last version (perhaps the bug was ported over from FileMaker Go 11), Since April 2013, the issue has not been fixed properly across the full FileMaker Pro 13 product range by checking that the GetNthRecord function works properly. 2. I note from the FileMaker Forum a developer wrote in February 2012 under the title “SECURITY ISSUE: Can’t Hide Data Viewer from User’s…” how the data viewer allows any user with a copy of Advanced app to view data in any field of any table in any non-admin/developer login account. Prior to FileMaker 10 the data viewer button for selecting fields to view data would be greyed out (unless you are actually logged into the developer account to modify the database). This is no longer the case and, in fact, FileMaker’s recommendation is to request that users do not use the FileMaker Pro Advanced app. Unfortunately I cannot monitor this with my clients and, therefore, consider this a major security flaw in the product. I concur with the other developer. And now I see the issue has not been fixed since I mentioned this with FileMaker Inc in December 2012 (in writing). All that FileMaker Inc will do is force developers to use the new database file encryption option. However this new feature places an unnecessary burden on my clients by introducing another level of authentication and to further compromise the intellectual property of my solutions when I cannot remove the admin account with Runtime solutions just to satisfy the encryption requirements. 3. A serious bug existed when working in scripts causing sudden and unexpected quits (especially in FileMaker Pro 12). While I lived with this problem (the essential scripts were in place and I can minimise the crashes if I don’t do too much work in modifying scripts), I see the latest FileMaker Pro 13 may have addressed this issue. However, the bug seems to have been moved over to the launch sequence when starting up a database. It doesn’t happen all the time (so far about a dozen times for myself since I purchased FileMaker Pro 13 Advanced). It also occurs when you are in a text field for more than 15 minutes doing changes to the text and you don’t save the text by committing the record. As a result, time is wasted waiting for the FileMaker Pro app to check the integrity of the databases. Furthermore my clients feel concerned about the possibility that such unexpected quits may cause irreversible damage to the databases should the problem persist over a period of time. Prior to FileMaker Pro 12, I have not seen this level of serious bugs crashing the app so easily. Now I understand my clients concerns and feel FileMaker Pro 13 is not up to scratch for prime time use in real world database solution environments. After noticing these issues and explaining them to FileMaker Inc and requesting these issues by fixed as quickly as possible, the company has agreed instead to provide a refund for FileMaker Pro 13 (i.e. within the 30 days of purchasing the product). I sense the company may not be interested in fixing these issues with the potential that Apple could be trying to drop further development work of FileMaker Pro in the near future. Why? Apple does not like consumers to get free or low-cost FileMaker contacts databases to bypass the company’s own contacts.app for identifying users and sending personal details to the iCloud. FileMaker Pro should only be used for large organisations and not for individual consumer use. Given how long the company has been notified of the above issues, this appears to be the case. I do note that numerous FIleMaker developers have complained in the past about how each upgrade of FileMaker under the control of Apple has only provided few extra features, but not substantial enough to be considered good value for money. I just wonder whether Apple/FileMaker Inc is serious about its commitment to providing a good product to the consumer? But if this isn’t the case, I strongly recommend you check your FileMaker Pro 13 product very carefully. If it works for you, fine. If it doesn’t, get a refund. The more people who get refunds, the more likely FileMaker Inc will make efforts to fix bugs and provide a quality product to the consumer.